First thing after my workout this morning (2.5 miles run + 20 minutes strength) I came home and put up my grow lights. My setup consisted only of what I had around the house: An unused desk, a couple of extra chairs with good chair backs, an old closet rod, the garage studio fluorescent lighting I mentioned in my last post, and some rope. Rod over chairs, over desk, light strung up using the rope with a slip knot so I can easily pull up the lights. The extra rope is secured so it doesn’t slip. The light is pretty narrow, so I moved my plants within the tray to maximize their exposure. Notice how they are leaning towards the right? They were reaching toward the sunlight in the window. I just checked on them, and after only an hour they are starting to stand tall and straight. According to the little class I attended at the USU extension spring fair, seedlings need 12 to 14 hours of light. A timer is useful, but I don’t have a reliable one (our good Christmas tree timer burned out this year, the bad one doesn’t always work). So I’m putting a reminder on my phone until I do get one. Besides, checking on them is a good idea and I want to take daily pictures of them from the same place to document their growth, plus it’s part of establishing a daily habit to attend to the garden. 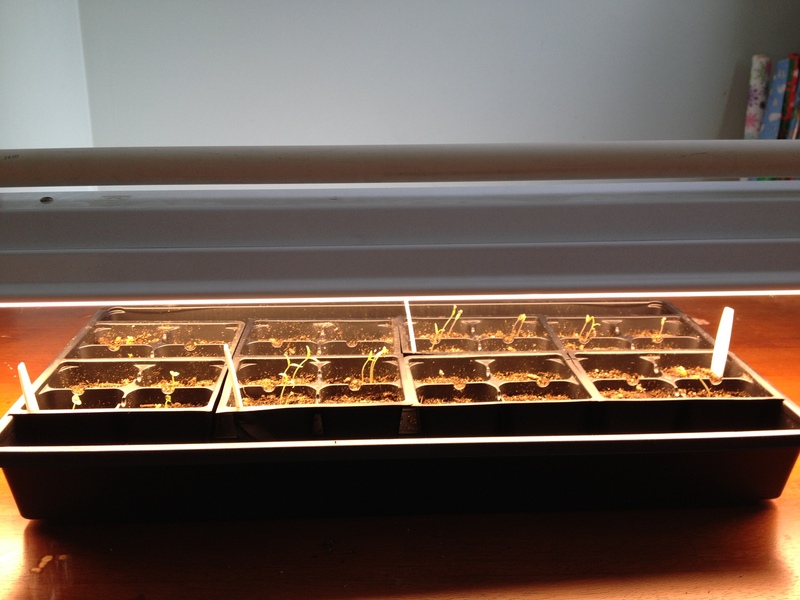 Early hindsight: I was told on friday (at that class) that I did need a warming mat to germinate the seeds. However, I noticed my first basil seedlings Saturday morning, and my tomatoes in the evening and Sunday morning. The greenhouse cover did a good job of keeping them warm. So I’m not convinced. I did, however, noticed that the seedlings farther away from the window were the ones that popped up first. I suspect the ones right next to the window had the heat leeched out. Previous My seedlings are up!